Perceptions of a technology can shape the way the technology is used and adopted. 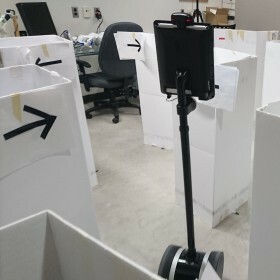 Thus, in teleoperation, it is important to understand how a teleoperator’s perceptions of a robot can be shaped, and whether those perceptions can impact how people drive robots. Priming, evoking activity in a person by exposing them to learned stimuli, is one way of shaping someone’s perception. We investigate priming an operator’s impression of a robot’s physical capabilities in order to impact their perception of the robot and teleoperation behavior; that is, we examine if we can change operator driving behavior simply by making them believe that a robot is dangerous or safe, fast or slow, etc., without actually changing robot capability. Our results show that priming (with no change to robot behavior or capability) can impact operator perception of the robot, their teleoperation experience, and in some cases may impact teleoperation performance.